We offer a variety of Assistive Technology Resources at our MassHire Metro North Career Center locations. See below for more information on what we provide or contact us with any questions or additional information. Do you have a disability? Are you looking for a job? 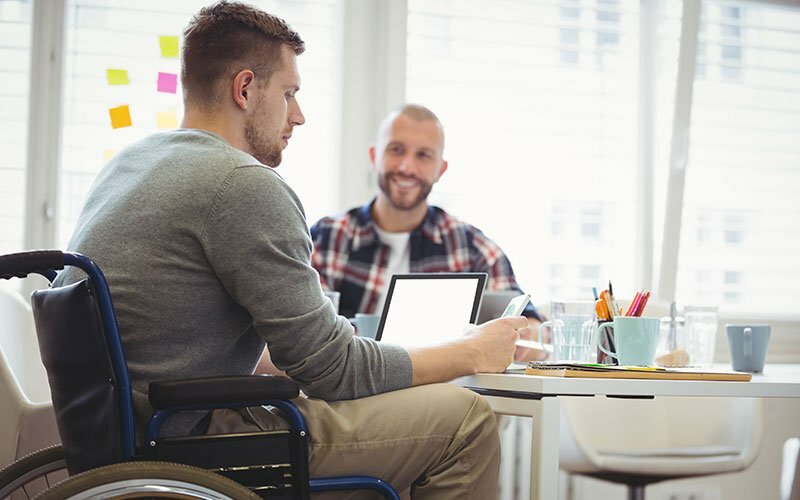 The Vocational Rehabilitation Program can help you find and keep a job. Video Relay Service with Sign Language Interpretation – Convo Relay video service connects sign language users with a live interpreter who translates conversations between sign language and spoken language. This service can be used in a private area for job interviews. Sorenson VRS – Video relay service connects sign language users with a live interpreter who translates conversations between sign language and spoken language. This service can be used in a private area for job interviews. Visual Magnification Equipment – Freedom Scientific TOPAZ and Clearview 500 magnifier provide users the ability to view books, job and recruitment flyers. An enlarged image of the object is displayed on a large screen. PEARL Camera – A camera that works with JAWS scanning and reading software, brings blind and low vision users access to printed material. The camera is connected to job search workstation and snaps a picture of the reading material. ZOOM TEXT – A fully integrated magnification and reading program tailored for low-vision users. Magnifier/Reader enlarges and enhances everything on your computer screen, echoes your typing and essential program activity, and automatically reads documents, web pages, email. MassHire Metro North Career Center has procedures and guidelines to handle requests for reasonable accommodations.